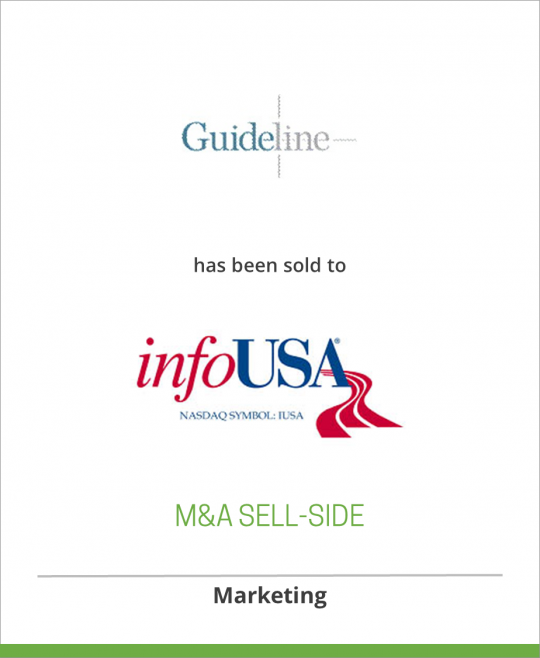 Guideline, Inc. is the nation’s only single- source provider of customized business research and analysis. Through its end-to-end continuum of On-Demand Business Research, Custom Market Research, Strategic Intelligence, and Product Development Intelligence, Guideline’s research analysts create integrated solutions that enable clients to make informed decisions to address their critical business needs. Guideline specializes in nearly all major industries, including media and entertainment, healthcare and pharmaceuticals, financial and business services and consumer products. More information is available by visiting www.guideline.com. infoUSA (www.infoUSA.com), founded in 1972, is the leading provider of business and consumer databases for sales leads & mailing lists, database marketing services, data processing services and sales and marketing solutions. Content is the essential ingredient in every marketing program, and infoUSA has the most comprehensive data in the industry, and is the only company to own 12 proprietary databases under one roof. The infoUSA database powers the directory services of the top Internet traffic-generating sites. Nearly 4 million customers use infoUSA_s products and services to find new customers, grow their sales, and for other direct marketing, telemarketing, customer analysis and credit reference purposes. infoUSA headquarters are located at 5711 S. 86th Circle, Omaha, NE 68127 and can be contacted at (402) 593-4500.